Buying a high-rise is very different from buying a single family home. You have to consider assessments, amenities, HOA fees, views, pet policies and much more. Even though we love the high-rise lifestyle we are the first to admit that it's not for everyone. As Portland's only boutique real estate company focused on the high-rise condo and loft market our goal is to help you decide if a high-rise is right for you, and if so which one suits you best. 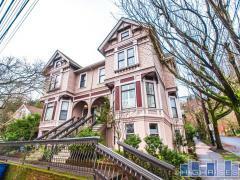 Want to chat about Portland condos? Have any questions about certain buildings? Call us anytime at 503-567-7979, stop by our office or send us your question with the form below. We look forward to talking with you about Portland condo living! As a Broker & Owner of Highrises Realty, I've helped scores of people buy and sell condominiums all over Portland. Focusing on Portland's condo market allows me to share with clients my wealth of knowledge on all the rules & regulations that govern the Home Owners Associations of Portland's condominiums. Besides being a Certified Condo Specialist, I also have a Master of Science in Education. I was an Assistant Professor at universities in Poland, France, South Korea, Thailand, Japan and the United States. My teaching career taught me negotiation, conflict resolution, creative problem solving, and open-minded communication. You'll find that I am open and easy to work with. Please reach out anytime. I enjoyed growing up in rural Southeast Alaska before moving to Oregon as a teenager. Following high school in Eugene, I attended Southern Oregon University, where I played college basketball and graduated with a degree in business. My real estate career began as an investor and I continue to own rental properties today. I’m licensed in Oregon and Washington and have extensive knowledge of condominiums and new construction in Portland’s urban core. Within the condo market, my specialty is working with Buyers who are downsizing from single-family homes into condos for the first time. The Pearl, Cultural, Old Town, SW Waterfront, and Hayden Island neighborhoods are my focus. Staying active in the Portland community is my priority. From neighborhood association meetings, to volunteering with the Pearl District Foot Patrol, to talking shop with building residents outside our Pearl District office, I’m focused on people and Portland. Ian joined Highrises in early 2017 after 15 years of working on the lending side of real estate. Emily graduated from New York University with a BA in Economics and Finance and joined Highrises in 2017. Ian and Emily live in the vibrant Pearl District with their two dogs, Bean and Chloe. They are passionate about helping people with one of their biggest investments, buying or selling their home.